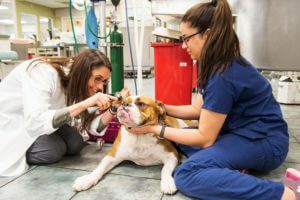 Brainstem auditory evoked response (BAER) testing is an electro-diagnostic test used to evaluate the hearing of dogs, cats and other domestic animals. It evaluates the components of the external ear canal, middle/inner ear cavities, cranial nerve and selected areas of the brainstem. It is a non-invasive procedure that takes 5 to 15 minutes to perform. In some circumstances, sedation is used. If the hearing threshold needs to be determined, more often in older patients, general anesthesia is recommended. From small subcutaneous electrodes and externally applied acoustic stimuli of different intensity, we record numerous waves, each of which represents composite neuronal activity. What are the uses of BAER testing? 1. Early diagnosis of hearing loss secondary to cochlear agenesis/degeneration. 2. Assessment of brainstem (caudal part of the brain) function. 3. Conductive hearing loss, which is the result of a dysfunction of the external ear canal and middle ear space. 4. Sensorineural hearing loss, which is the result of dysfunction of the cochlea, cochlear nerve or central auditory pathway. Most responsible breeders of dogs who are high risk for congenital deafness will test litters of puppies before selling them. Such breeds include Dalmatians, English setters, English cocker spaniels, Australian cattle dogs and Jack Russell terriers. We test these puppies at seven weeks of age. 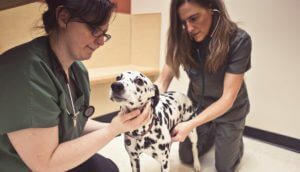 Because dogs can lose hearing up to 16 weeks of age, retesting is often done, especially before breeding; if there is a questionable reading on the first test; or if the owner notices any problems. If a puppy tests negative in one or both ears, usually nothing can be done to regain hearing if they suffer from cochlear degeneration. The ears are checked for any type of infection, which can interfere with the test, but congenital deafness cannot be restored. Chronic ear problems can cause thickening of the ear canals and cause poor signals to the brainstem, which would cause poor hearing and a questionable test. In this situation the patients will often be retested after being treated appropriately. A dog that seems to be able to hear but cannot locate where the sound is coming from may be affected by unilateral hearing loss (hearing in one ear only). A BAER test can confirm this and identify the affected ear. Raising a deaf dog takes patience, but it is sometimes easier if the deaf dog is raised with a hearing dog. Having deaf dogs around children can be risky because they often startle easily and may strike out at a child who comes too close or surprises them from behind. Because they cannot hear traffic, deaf dogs must be supervised outside to ensure they are not hit by cars.